Powerful DWDM Specifications: With excellent ORR, resolution bandwidth, wavelengthrange and dynamic range, the FTB-5240 OSA provides flexibility and power. With evenbetter ORR and high resolution, the FTB-5240B is ready for the next generation of ultradense WDM.Easy to Use: One-button operation. Automated functions are accessed through a simple,intuitive touchscreen interface. 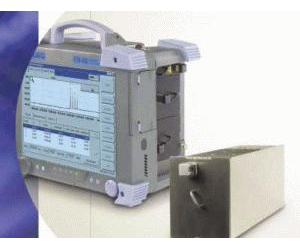 The graphical user interface provides easy access to menusand functions.Rugged Portability: Housed in a tough, lightweight magnesium shell and rubberbumperedFTB-400 UTS, EXFO s OSA will survive bumps and drops in the field or froma lab bench.Best-in-Class ORR Option: The new FTB-5240B option provides unmatched accuracy forOSNR measurements, thanks to the best ORR in the industry: up to 40 dBc at 0.1 nm,50 dBc at 0.2 nm and 55 dBc at 0.4 nm. ** Internal Calibration: The new FTB-5240B has an internal reference light source thatmaintains wavelength uncertainty at ± 30 pm in the C+L band.External Calibration: Use an external source to recalibrate your OSA prior to test sessionsand achieve wavelength uncertainty as good as ± 15 pm in the C+L band.